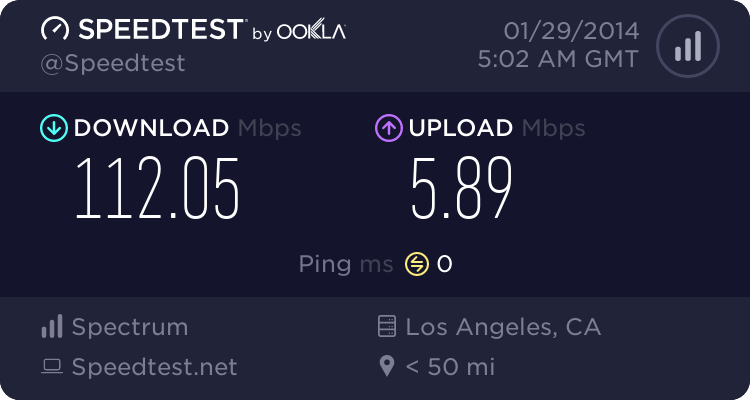 What is YOUR download/upload speed & ping? Check here in this link if you don't know. It's easy (for those who have never used it before). Just click begin test and you get your results. This is on wifi. If I plug it in I get 50+ Mbps for download with my upload being close to what it is on wifi. Edited by PhillyLaker24, January 28, 2014 - 01:35 PM. ^ How much do you pay per month? I'll ask this for everyone then cause I'm curious in general. What are you guys paying per month as well? I'm paying 60$ a month, I need to shop around now. I have gigabit on my dedi (which is nice), allowing me to download an HD movie in less than a minute. 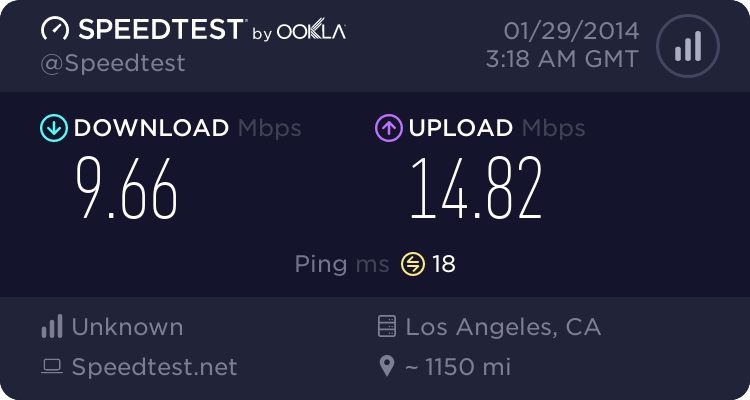 My personal network has a ping of ~19ms and fluxuates between 25Mbps-75Mbps depending on how much bandwith I use in a month (I think my ISP hates me lol). 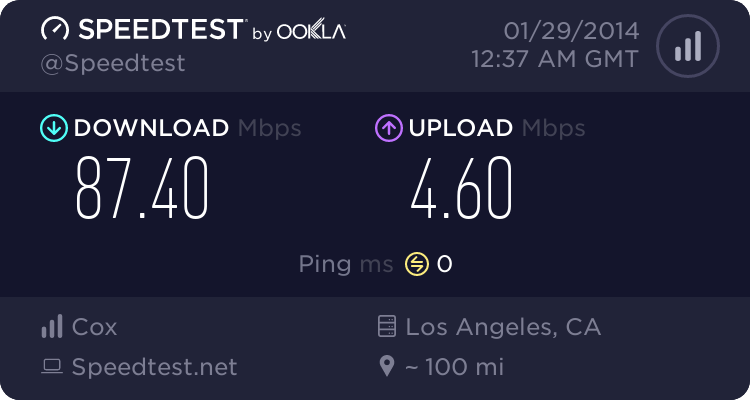 My upload is around 6Mbps on average. Edited by -Wade-, January 28, 2014 - 02:19 PM. Its like 50 bucks a month on comcast with the deal I have. Not bad for the speed. What's your ISP for the dedi? What I do is download media content (like movies) on the dedi and then just live stream it to my local network. It saves me time and then antip2p has a harder time tracking me. If you want to do the same thing, you could do it with a gigabit VPS rather than a dedi and save some good money. Edited by -Wade-, January 28, 2014 - 06:23 PM. This thing is wacky. 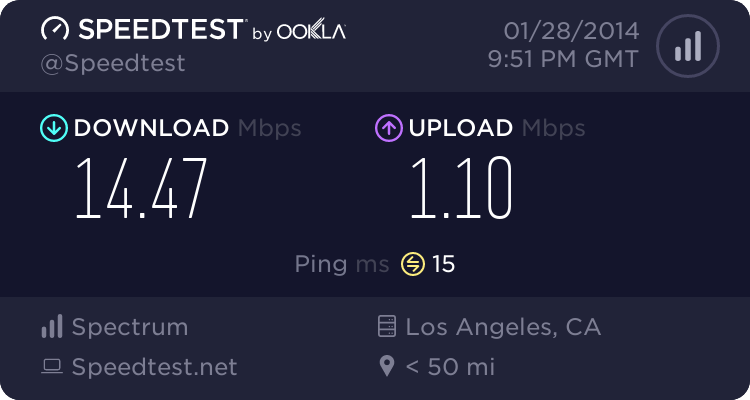 The first time I ran it the PING was 9 and the upload was around 9 too. Interesting to see we have quite the variations in here. What's the company name cause I'm paying just a bit more than that & get much slower speeds than what you're getting? Edited by KB24, January 28, 2014 - 09:02 PM. ^ Look at you! [expletive]in' beast mode there. How much you payin' patna'?